1/6/13 Preparing to bottle the 2010. It looks like we will end up with 1680 bottles of wine rather than 1620 in the co-op which is what we expected initially. The syrah could stand some additional racking so the plan should be to bottle Cabs first and rack the syrah's at the same time. Then bottle the syrah's in subsequent bottlings. We expect it will take 3 weekends to bottle all of the wine. RC5 1/2 Barrel = 25 gal. 88% Camalie Cab @12.9% alc. 50% Camalie Cab @12.0% alc. 66% Camalie Cab @12.9% alc. 9/26/12 Checked Konrad Cab in RC4 for Free SO2 with titret and got 70ppm which is plenty. No need to add sulfite. 8/12/12 Wine racked from Barrel to barrel to aerate and introduce some oxygen. See book for details. 3/25/12 Racked from D1 to LG2 70% Konrad Cab, 30% Syrah, and Q1 to D1 Cam Cab 88%, Syrah 12%. 10/9/11 Racked LG1 to SG4 60% Cam Cab, 40% Syrah A. Syrah needed aeration. 6/5/11 Rached Syrah's by myself. Syrah's stinky need oxygen. LG1- Tank, D1 to LG1, LG2 to D1,Q1 to LG2. 2/27/11-3/1/11 Racked all of the wine to barrels including racking of 2009 and bottling the last 8.5 cases of 2008-barrel SG4 See details in the winemaker's book. This was a very complex set of blends and racking. There are now 13 barrels in the cave 4 of which are half barrels. Our topping wine is a little less than anticipated and mostly consists of syrah which I am reluctant to use for topping of the cabs and carmeneres. We may need to sacrifice a barrel of cab for topping at some time in the not too distant future. 18 people tasted so the highest possible score is 18. This is the largest Barrel tasting we have ever had. 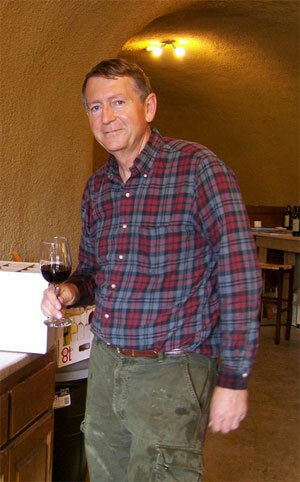 Noteworthy is that we were able to discern the 2008 wine and preferred it greatly to the younger wines. The top three wines were the wines with 2008 in them. Next of note is that blending improved most of the wines. 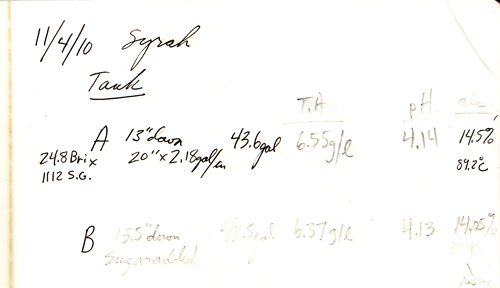 Putting some Syrah into the Konrad Cab moved it from 7th place to 3rd place in the ranking. Blending into the Camalie 2008 Cab though reduced its score in all cases although only slightly. It did raise the score of the wines it was blended with substantially though, most notable the Camalie 12% Cab which went from 6th place to 3rd place with the addition of the 2008. Carmenere 2009 + Camalie 2008 Cab ?/? needs alcohol. Typically we will need about 8% additional wine for topping. For 360 gallons of wine we will need 29 gallons which we will either bottle into magnums or put into a half barrel with a CO2 head. The blend matrix above leaves 25 gallons for topping. 12/15/10 McBride's TA came in at 4.1, 3.7 pH, with 23.1 brix, 244 g/L gluc/fruc ,and 120 yan. I got about 585 gallons of wine. It is still going through MLF, but yesterday I made an initial blend with 2.5% Petit Verdot. 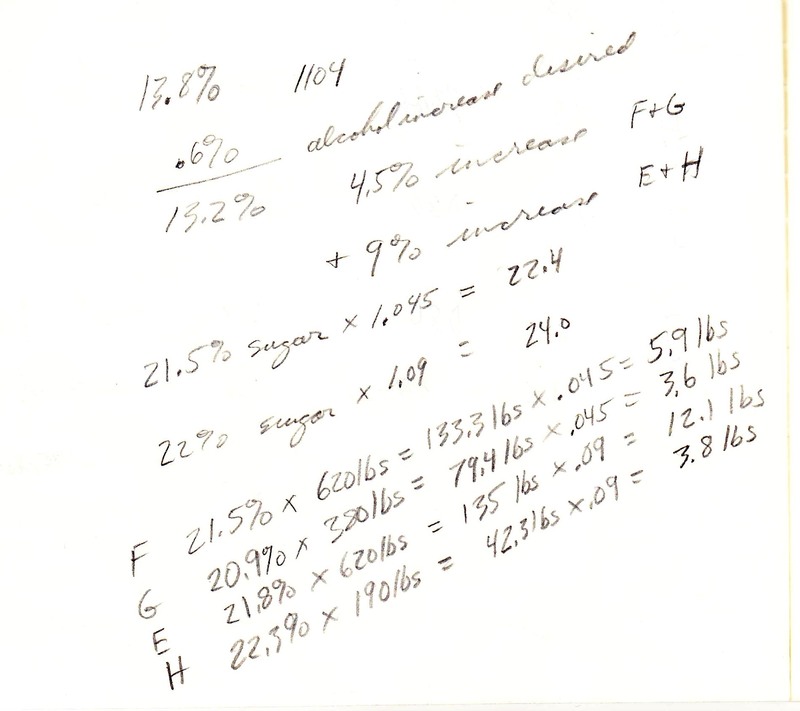 I am expecting (hoping, rather) for final numbers in the 14+% alc range (60% conversion rate on the 244 gluc/fruc) and 3.7 pH after it completes MLF. Interesting numbers. I predict your wine will end up with T.A. 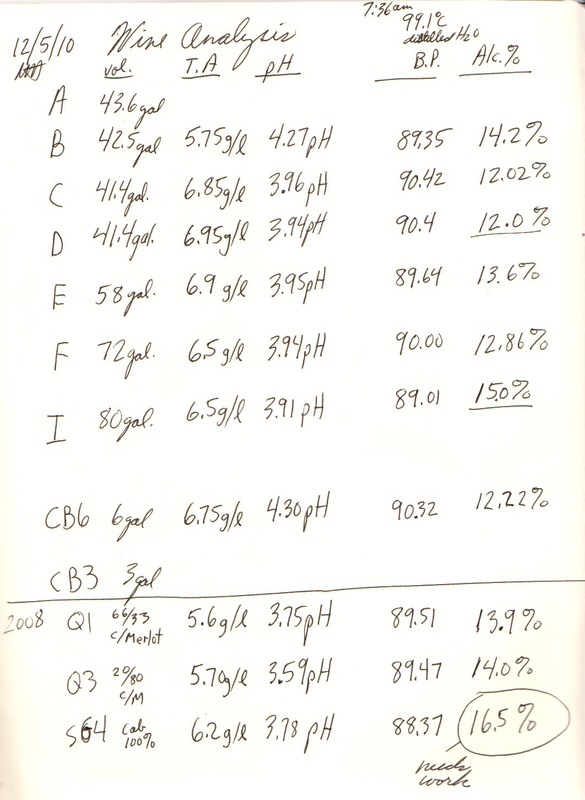 of 6.2g/l , alcohol of 13.4% and 3.9pH based on what happened to my wines. You will probably need to add a little alcohol. I am assuming your T.A. number was for the must before fermentation. I got 4.8g/l for the must and ended up with 6.5 g/l in the wine before M.L. I got 12% alcohol from 21.5 Brix grapes and 15% alcohol from Konrad’s 25 Brix K1 grapes. 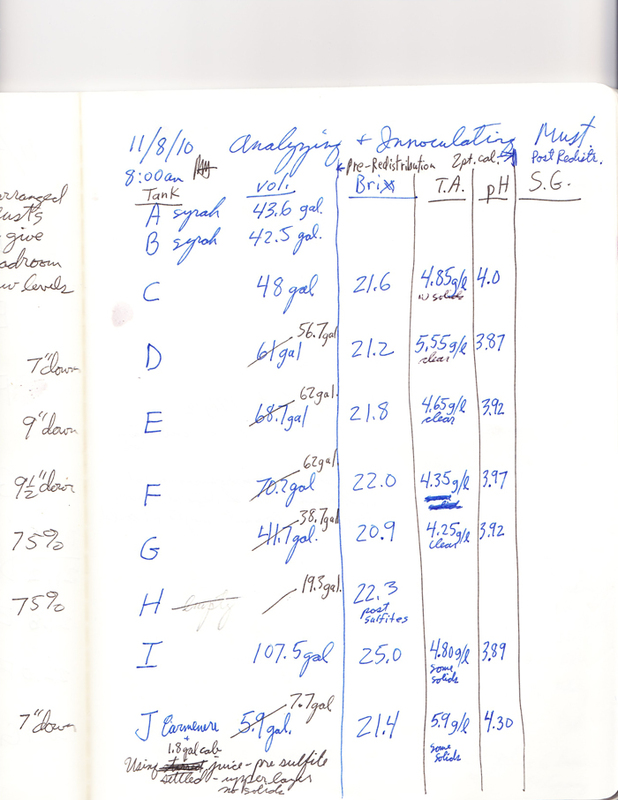 One of his customers did a slow, cold natural yeast fermentation and had acetic acid bacteria eat up 1.1% of his alcohol and a lot of the color. The tannins of the French clones are always quite mild or elegant as I like to say. It makes the wine drinkable a lot sooner. My 34 year old vines provide a striking contrast with much more tannin. If you want more tannin from the French clones and more color as well crank up the fermentation temp, extend maceration or add some enzymes. I believe this year we got more tannin and color because the grapes were so soft at the end and broke down easier. At least I am sure the color came out quicker just based on how the berries broke down in my Brix sampling. 12/5/10 I did the wine analysis below. Some conclusions from this are that the Camalie cab came in with lower alcohol than we targeted by about 1% and the acidities are on the high side. This will be O.K. since we plan to blend the Camalie cab with the Syrah which has plenty of alcohol and less acidity. I am also thinking about blending some of it with the 2008 Cab which has 16.5% alcohol. Subtotal of above: 386 gallons. If racking yield is 92% then we have 355 gallons to put in barrel which is almost 6 barrels. If we use half of the 2008 Cab below we will have 6 1/2 barrels of wine to fill. To reduce this total volume we can bottle some wine which will most likely be half of the 2008 Camalie Cab and some percentage of the 2009 Carmenere to make room for some of the 2008 Cab to bump up the alcohol. Below is the raw data. 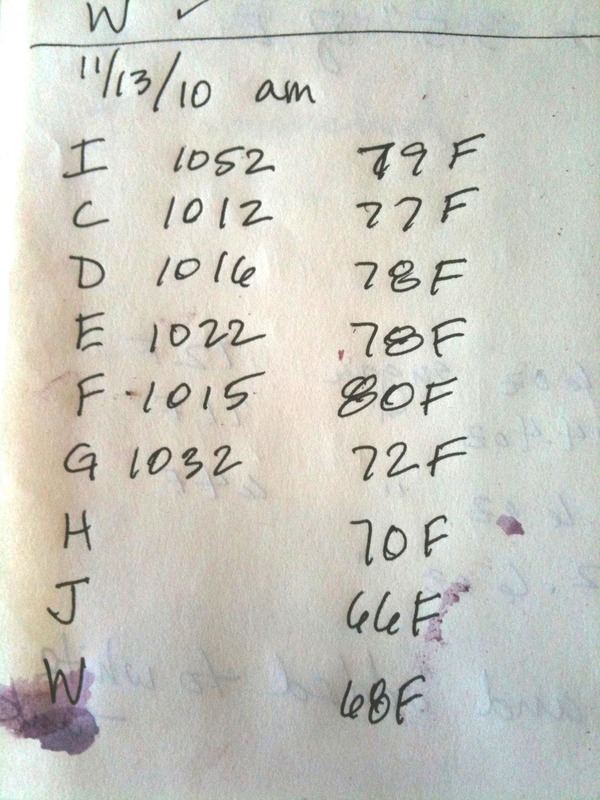 11/27/10 We pressed the remainder of the 2010 vintage, Tanks E,H,I and J. Below is the current inventory of wine we have to work with this year. No obvious impact on the flavors from the mold we saw at crush. Apparently our culling did a good job of removing it and what went in didn't have significant effect. 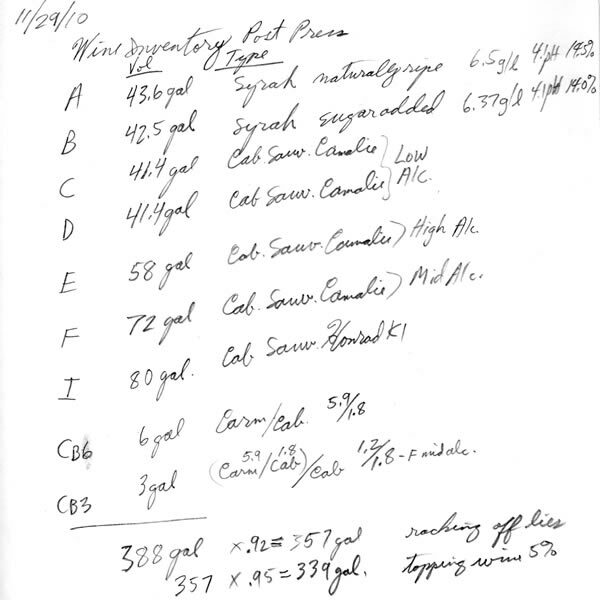 11/28/10 All of the remaining wine was innoculated for Malo-Lactic fermentation and nutrients were added for the M.L. bacteria. The total volume is currently 388 gal. but, is expected to shrink to 350 gallons with racking and use for topping. This means we will still end up with about 5.5 barrels of wine or 135 cases. 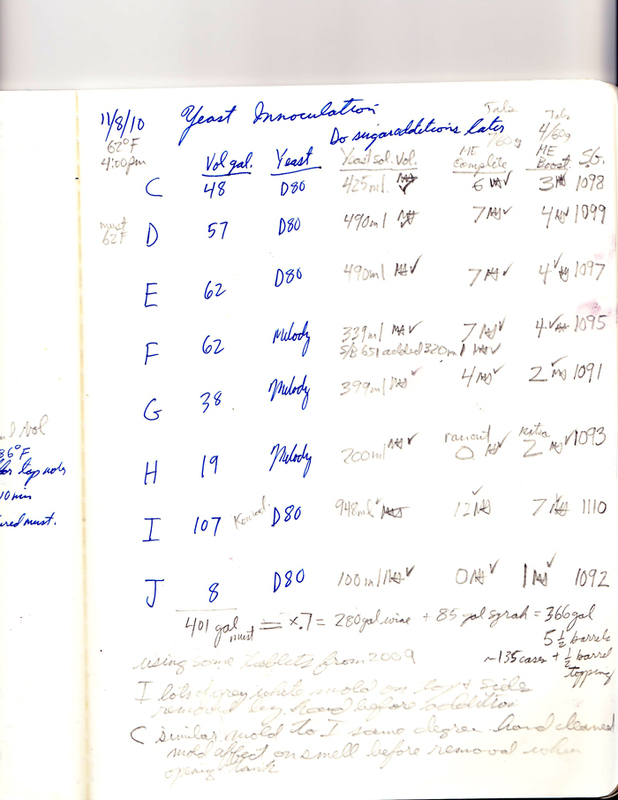 11/21/10 We pressed about 190 gallons of must from tanks C,D, F,G yielding about 170 gallons of wine. About half of the wine is left to press this coming Saturday, 11/27. The wine is tasting good. The lowest alcohol lot will probably need some blending up in alcohol which is fine since we have lots of syrah and Konrad's cab at 14.5% alcohol. Having the low alcohol wine will alow us to bring down the higher alcohol wines and make them more food friendly. 11/13/10 Here are the latest Specific Gravities. Moving along quite nicely. I is somewhat behind for no known reason. Its most unique feature is that this tank is twice as big as the other tanks. 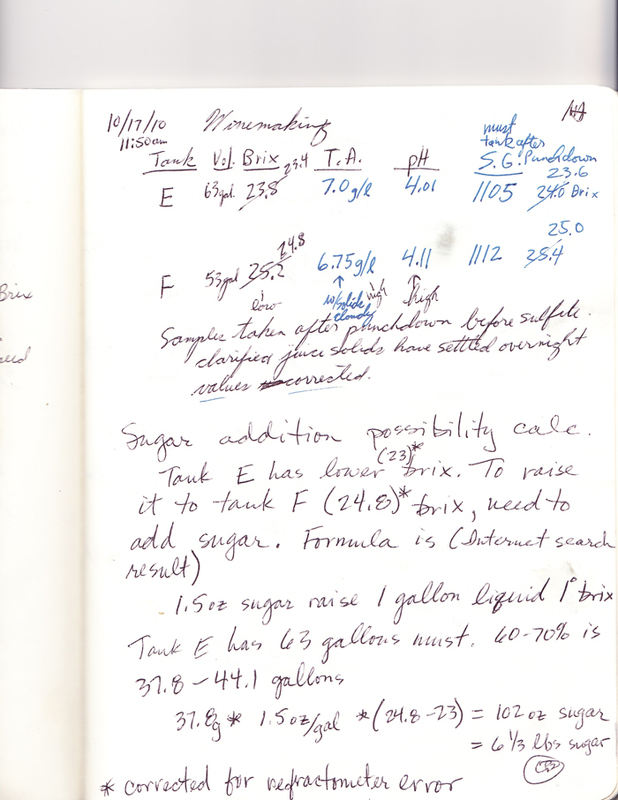 Following through on the general strategy outlined below Cindy and I have made specific sugar additions to particular tanks toward the goal of achieving the following barrels of wine. I expect we will do quite a bit of blending down the road which means that these targets are aimed primarily at generating a good mix of wines for us to work with down the road as we taste and experiment to optimize the blending. I anticipate we will put half the wine into new oak and half into older oak initially and then rack within 6 months to spread the new oak flavors around. 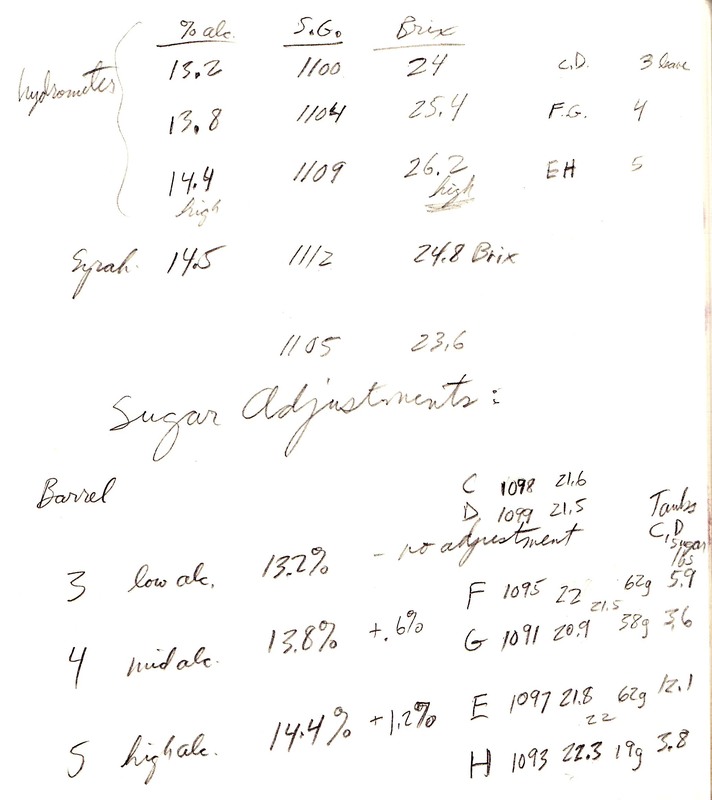 The page below shows the target barrels and the tanks we plan to move to those barrels along with the sugar adjustments to those tanks. Below is what the mold looked like on fruit left in the tank for a day before innoculating. This moldy fruit was all skimmed off before innoculating this tank. 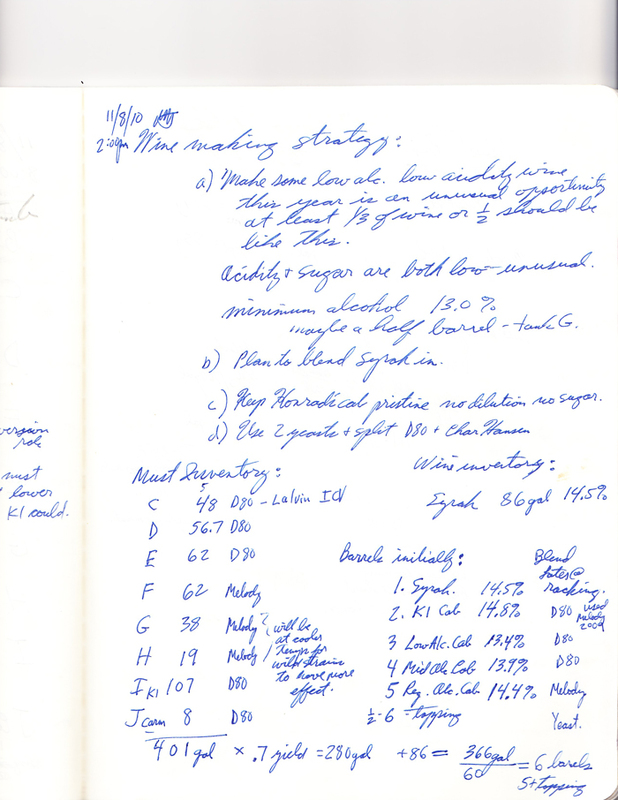 The tonnage of grapes received from Dr. Konrad's K1 was 959 lbs. = .479 tons. Some Camalie grapes were then added to tank I, roughly 11 gallons.